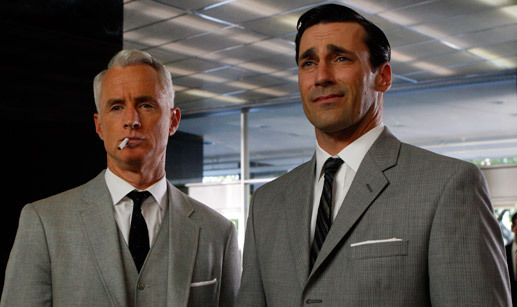 last night, I stayed up until two in the morning watching an entire season’s worth of MAD MEN on AMC. I remember seeing previews of it long before ( yes, I am addicted to the AMC channel. I like old movies, what can I say?!) and my interest was piqued if only for the fact that they used an Amy Winehouse track in the trailers. This was a while back and I had honestly forgotten about it, but here I was on a rainy Friday night, curled up on the couch in pjs with the remote at the ready. I saw the full seasonon the menu and decided to give it a go. The plotline basically follows a bunch of competitive ad men in New York in the early 60s. What I found most interesting was the behavior of damn near everyone in the office. All the main guys are married and of course all of them are sleeping with secretaries, models hired for ad campaigns, phone operators..just about anyone who comes through the doors. All the women on the show look so prim and proper with their ladylike skirts and blouses and they all fit the stereotype of women of that era I suppose in that their sole purpose in finding work was to find a husband. 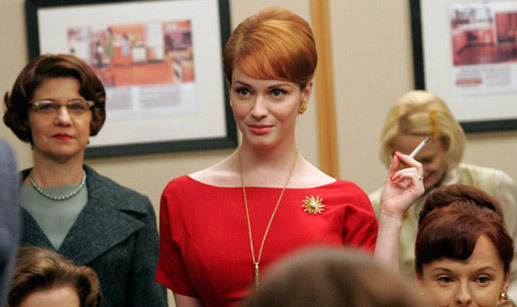 (Once they realized that all the men in the office are married, they, I guess like a certain sort of woman, learn to settle with being the woman on the side)Of course, my potential ADD raddled brain got distracted trying to keep track of the amount of cigarettes smoked on this show. Mein Gott! People were just smoking for no damn reason at all. Can’t sleep at night? Roll over and have a smoke. Kids sitting at the table having dinner. Sit with them and smoke. One lady had just had a kid, breasts leaking milk even and she’s lighting up! We get it we get it EVERYONE SMOKED BACK THEN!!! Aside from that distracting aspect of the show, overall its pretty good. Too bad for them they aren’t picked up by a major network. I haven’t heard anyone talking about it and despite a few small problems, its definitely worth watching..